We do this because the backend has permissions to contact the S3 services and obtain the URL when instead the frontend doesn’t. It marshals access to the resources for the frontend so that we avoid having to specify rules per-user ourselves. But how do you achieve the same result if you don’t have your custom backend? This can be the case if you’re only using Firebase to implement a data store for your frontend app. In order to send an HTTP request to the pre-signed URL from the frontend, we need to setup our S3 bucket with the correct CORS policy. If we fail to do so, our browser or app will fail to send the request. These allow all the possible HTTP actions on our bucket from any origin. You might want to create stricter rules, but that’s up to you. In order to allow the backend to successfully make calls to the AWS services endpoints, in our case S3, we need to create an IAM for it and then obtain the relative API keys. Essentially, make sure that your IAM account uses a policy which grants it full access over the S3 resource. You can use the AmazonS3FullAccess policy for ease. If you already have an IAM account, simply make sure that it has access to S3 resources. Obtain access keys for your IAM account, so that you can use them to login from the Cloud Functions: these will be given to you as a file either when you first create an IAM account or if you manually obtain them from the IAM management panel (in case you already have an account). Let’s write an example Cloud Function which allows the frontend app to upload a file to our S3 bucket. region: "YOUR_AWS_REGION" // (e.g. :)"eu-west-1"
First we’re importing the required Node.js modules: we need both the Firebase Admin modules and the AWS SDK module so that we can communicate to the S3 endpoint. which are used to configure the pre-signed URL. It’s constructed in the frontend app and sent along with the Google Cloud Function request. This way we can have a form in the frontend specify name of the file to upload, which file to upload, etc. Here we configure the AWS SDK with the credentials we obtained from the IAM role for the backend and then create an object which allows us to interact with the S3 APIs. Feel free to specify more parameters and to change the contents of the JSON data structure. Finally we send a request to the S3 API to get a pre-signed URL, and return the URL to the client. What if I want to download a file from an S3 bucket? Most of the code would remain the same. and on the frontend side, you’d send an HTTP GET request rather than a PUT one. 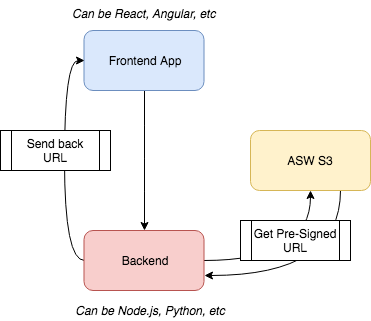 We’ve seen how it’s possible to perform complex backend-related tasks without having to roll our own backend by just using Google Cloud Functions. 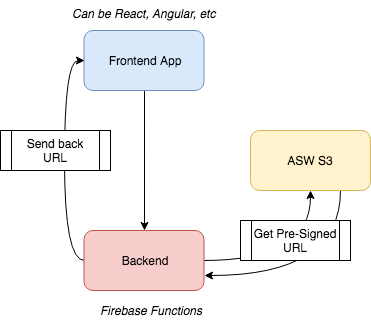 In many cases Cloud Functions suffice to run backend-related tasks and they give you the flexibility of not having to spend time writing boilerplate backend code, while at the same time probably being cheaper than having your own backend always up and running.